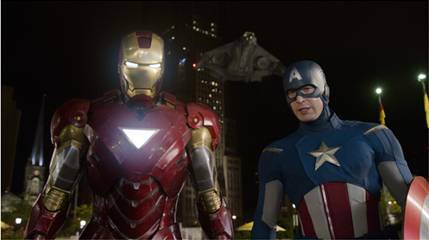 Marvel’s The Avengers In Theaters May 4th : New Clips & Featurettes! I love the clips and I can’t wait to see the movie!!! I’m a huge Robert Downey Jr fan and love “Iron Man” and “Captain America” so I can’t wait to see it!! Just wish my husband was here to watch it with me instead of on a year long deployment. This looks pretty good, although I have to admit I still haven’t seen Iron Man!! Saw the movie last weekend. It was fantastic! My son really wants to see this. Perhaps it’s a good one to see at the drive in this weekend. Love Samuel L. Jackson – I’ve been seeing a lot of blog posts about this movie but have yet to see the preview on TV! I don’t get a chance to watch much so that is probably why. I would like to take my kids to see this though – we haven’t been to the theatre in forever. I still haven’t seen this but it looks so good! It’s funny how I never seem to watch Marvel movies when they come out and I end up really liking them, to this day I haven’t seen The Avengers even though I constantly see stuff about it. I need to get myself to watch it! This actually looks like a movie even my husband would enjoy- when I first heard of it I thought it was animation! I loved this movie. I went to see it twice cause I was honestly distracted by Chris Hemsworth (Thor) too much the first time. My husband had to watch Thor twice too cause of this reason. LOL! Well the movie has been out for a while now and I took my family to see it when it first came out and wow, it was everything I’d hoped it to be and more. It was fantastic family fun. One character that I was a bit worried would be over shadowed was the Black Widow. Her and Hawkeye are the members with no real super powers. Yes they are the best at what they do and their abilities far exceed normal people, but they are not super human, or have super tech suits of armor. Boy was I suprised at how they made them, especially Widow, fit right in with the others. They way she played Loki into revealing his plans was awesome. Great cast, great movie! still haven’t seen this but can’t wait to!! I’m excited for this to be released on DVD. Saw the movie. It was fantastic!